The wood pallet is currently the default device used for transporting used lead acid batteries (ULAB) in Australia. It has become the de-facto standard for several reasons, including its low cost and widespread availability which also combine to eliminate the need to return the pallets to the consignor. Wood pallets are also the stated preference of the Australian battery recycling facilities. The wood pallet however has several significant drawbacks when used for transporting ULABs and the apparent economic advantage of one-way transport compared to using returnable plastic containers, disappears upon closer inspection. What Are the Concerns with Using Wood Pallets? Wood pallets are plainly inadequate for capturing acid leaks during ULAB transportation (and storage) and due to the battery acid containing high levels of lead and other toxic heavy metals, create a threat to human health and the environment. The World Health Organisation has identified lead as 1 of 10 chemicals of major public health concern and currently and suggest there are currently no known levels of lead exposure that are considered safe. In fact, the UN Basel Convention’s “Technical guidelines for the environmentally sound management of waste lead-acid batteries”, states that the sulfuric acid electrolyte contains high lead levels, as soluble ions and particulate forms and hence “used lead acid batteries must be transported inside sealed containers due to the risk of leakage”. Many West Australian’s still remember the lead poisoning incident that occurred in 2006, when lead dust escaped into the environment during transport or ore from a Wiluna mine to Esperance port. The result was one of the State’s worst environmental disasters with thousands of birds dying, 33 people testing for unsafe blood lead levels and the resulting 5-year clean-up costing the state government in-excess of $25M. While the health risks from transporting lead acid batteries are probably not comparable, lead dissolved in acid could be a problem due to skin absorption of the lead from touching contaminated pallets and batteries. Workers working in lead industries have a potential chronic exposure problem and need to be monitored for lead blood levels and that the use of wood pallets can only serve to increase this risk. The second major concern with the use of wood pallets is the safety and environmental risks posed to the Australian public due to the systemic non-compliant packaging and transportation of batteries. To understand why wood pallets are contributing to non-compliance we need to examine the packaging and transport requirements in the Australian Code for Transportation of Dangerous Goods (ADGC). For lead acid batteries the packaging requirement are outlined in the ADGC P801 Packing Instruction. For wood pallets, lead acid battery layers need to be separated by a non-conductive layer of sufficient thickness (needs to be 30mm), such that a superimposed battery is not being supported by the terminals of the underlying batteries. The batteries should then be wrapped in plastic and secured horizontally and vertically by high strength plastic strapping and the appropriate dangerous goods labels applied. Now if that sounds like a lot of work – it is! and it is neither an easy nor safe task trying to stack batteries of all different sizes on top of each other. Combined with variations in worker’s attitudes and training, non-availability of the required materials and tools (e.g. heavy-duty wood pallets, plastic wrap & straps, strapping tool & 30mm non conductive separators) and the economic cost of performing this task and you have a recipe for short cuts to be taken. It should therefore come as no surprise to anyone that this is exactly what is happening in the Australia. Below is a photo (2017) of a truck delivering batteries from regional WA to a Perth Scrap Metal Dealer. The journey from Busselton to Perth takes approximately 3 hours. Note the batteries have not been wrapped and strapped and the vehicle has no side gates. It doesn’t bear thinking what could have happened if this vehicle was involved in an accident. If you think the above example is an isolated incident you would be wrong; you can readily witness batteries being transported loose in the back of utes and trucks delivering to scrap metal yards. A more typical scenario is shown below, where these batteries were delivered from the WA Goldfields to a Perth Scrap Dealer’s yard. Separators have not been applied between the battery layers, but perhaps of greater concern is there is no strapping and the pallets have not been restrained to the vehicle. A few layers of plastic wrapping are not going to adequately secure a tonne of batteries in the event of a vehicle accident. The only time the industry appears to make a modest attempt to transport lead acid batteries compliantly is when shipping the batteries interstate to the battery recyclers, however I use the word “modest” deliberately as the majority are shipped with inadequate or no separators. Unfortunately, most batteries have already been transported several times before this final leg of their journey and the level of regulation compliance for intra-state transport is virtually non-existent. I would estimate that in-excess of 95% of batteries are being transported non-compliantly and this can simply be verified by observing deliveries being made to the big battery aggregators in each state. The photo right, shows a fire that occurred at a Perth Scrap Metal Yard in 2018. 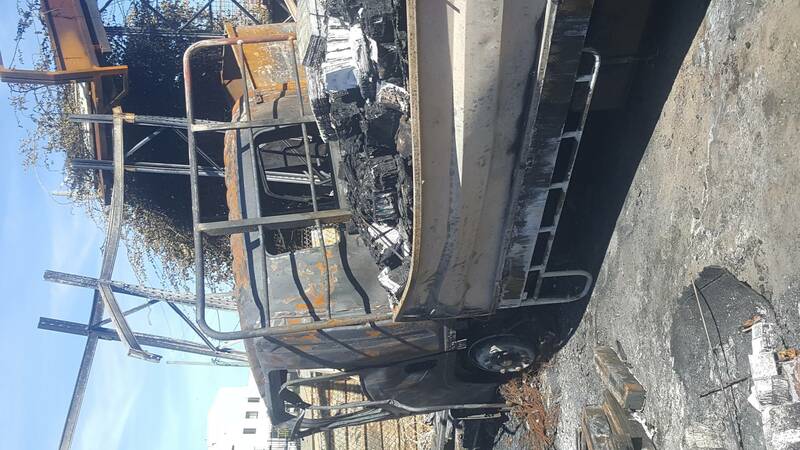 The fire started on the truck while parked with a load of used lead acid batteries. 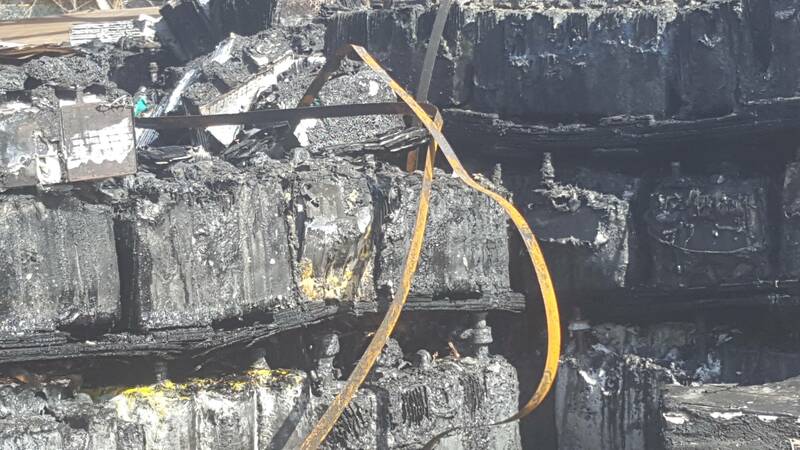 The cause is suspected to be metal strapping, used to secure the batteries to the wood pallet, that resulted in a short circuit. The incorrect application of metal strapping is reportedly the most common cause of fires when transporting ULABs. Consignors should use high strength plastic strapping; however metal straps are often used because of the unavailability of the plastic strapping. Incorrectly applied metal strapping believed to be the cause of the fire. This photo http://www.abc.net.au/news/2017-11-05/crashed-4wd-in-lower-king-north-of-albany/9120588, shows a 4WD, that crashed in November 2017 and killed the 2 occupants, in Albany, WA. The 4WD was carrying a load of used car batteries at the time of the accident and the photo shows the batteries strewn around the crash site. Whether the batteries contributed to the severity of the accident is unknown, but it certainly could have. The systemic non-compliance of the packaging and transport requirements is increasing the risks to industry workers, the Australian public and the environment in the event of an accident. I believe it is not a question of if but rather when, that a load of poorly packaged & inadequately restrained batteries will contribute to a road fatality. The use of wood pallets is significantly contributing to the high levels of non-compliance and hence to this risk. Contributing to the widespread and systemic noncompliance by the battery recycling industry is minimal to almost non-existent policing by Government departments responsible for their enforcement. On one hand I have some empathy for the responsible departments, often under resourced, they need to prioritise the use of their resources to inspect and prosecute breaches for dangerous goods that pose a higher threat to the public and the environment than batteries do. That said, with approximately 135,000 Tonnes per year of used lead acid batteries being transported from all over Australia on wood pallets to NSW for recycling, I believe the risks are not insignificant and if little policing is going to be undertaken and there is wide spread noncompliance, then why bother with any regulations? I would challenge that with smart deployment of officers that effective and leveraged results can be achieved. Every state has several large aggregators of lead acid batteries, these companies receive batteries daily from deliveries made to their yard and / or from their own collection efforts. An officer parked at the front would quickly observe the high level of noncompliance that is occurring. Furthermore, if there are no prosecutions being made then the current behaviours and contempt displayed by the industry will continue. This is a natural law of human behaviour, that Steven Levitt of Freakonomics fame would have readily predicted. For the 3 states I checked, NSW, Victoria & WA, I was able to find only one instance, in the last 6 years, of a company being prosecuted for non-compliant transportation of lead acid batteries. If more have occurred, then they need to be easier to find and more visible. With the increased availability of plastic boxes of suitable strength and capable of retaining acid leaks, Battery Rescue believe it’s time the industry moved away from the use of wood pallets for storage and transportation of used lead acid batteries. The use of plastic containers / boxes would immediately improve the level of compliance by the industry and reduce the risks to the public and the environment. Plastic boxes/bins are the main method used in Europe to transport lead acid batteries for recycling. Yes, they have an advantage in that the transport distances are much smaller than in Australia but maybe it’s because they are more environmentally conscientious than we are, after all their dry cell battery recycling rates are approximately 50 times what they are in Australia. Kevin Jones, Director of Fleetrak Consulting (formerly the International Business Development Manager for Chep Pallecon Solutions APAC), demonstrated that despite the additional costs of washing and returning the Containers within Australia, that on average there is a saving of $21 per tonne of batteries transported using plastic Containers versus wood pallets. The savings are due to the time and materials involved in preparing the batteries for transport on wood pallets and the efficiency gains of automatic unloading from plastic boxes. In other words, there is no cost to change to a closed container pool system, for the vast majority of ULABs collected within Australia, with the exception of the most remote locations. The experts are constantly telling us that we are living in a rapidly changing world, which may be true in some respects but paradoxically humans can be very slow and resistant to change existing ways of doings things. Consider the story of Malcom McLean, the American businessman, who developed and patented the modern intermodal shipping container, which has revolutionized transport and international trade. Yet despite the obvious efficiency gains of containerised transport he encountered fierce resistance from the transport industry and it took many years before the concept became established. Revise current ADGC Packing Instructions for lead acid batteries so that requirements are clearer and less ambiguous. Used battery generators need to support battery collection services that use a plastic box / container. If your current collector is transporting your batteries on wood pallets, then this is probably not complying with current regulations, is unsafe and damaging the environment. The amount you can get paid for your batteries in return for this trade-off should not be your primary consideration. Government regulators need to regulate. Starting with a campaign targeting the large battery aggregators and resulting in several high-profile prosecutions. 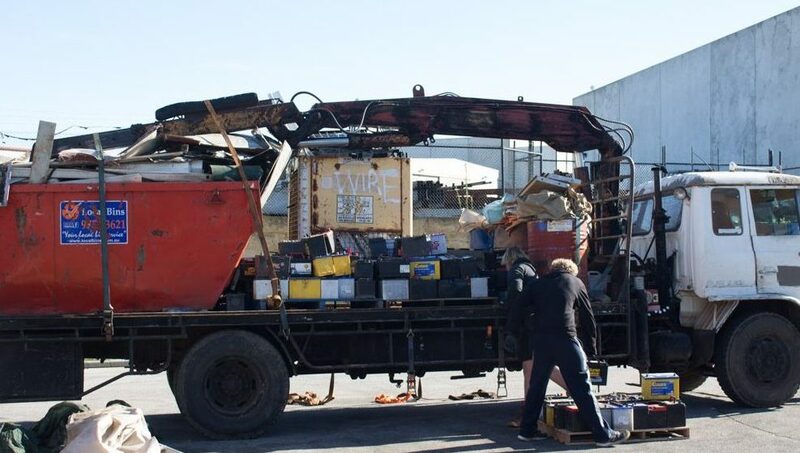 Like the Europeans, the Australian Battery Recyclers need to install the necessary equipment to enable automatic unloading of batteries from plastic containers. The use of wood pallets should be eliminated as an option for transporting used lead acid batteries from the Australian code for the transportation of Dangerous Goods. The industry should be given a couple of years to transition away from wood pallets to a plastic container solution. It is only with this sort of combined action that enough momentum will be achieved to overcome the inertia that exists in the industry and bring about a safer and more environmentally sustainable, Australian lead acid battery recycling industry. As a provider of a battery collection service that uses a plastic container specifically designed for the safe & environmentally sustainable storage & transportation of used lead acid batteries I clearly have a vested interest in seeing the use of wood pallets discontinued. I am, however unapologetic and unrepentant in my bias, because of what I see as the clear failings of the industry and the wood pallet.